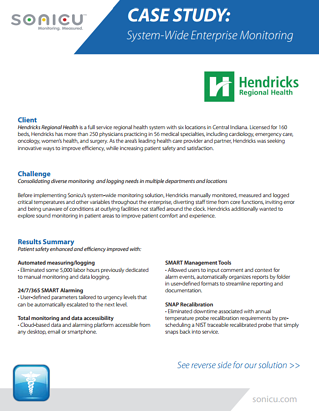 Find out how Hendricks Regional Health consolidated all of its monitoring needs - on-site and off-site - into one cloud-based platform. Hospital noise reduction, wireless temperature monitoring, power, humidity, air pressure and more can all be monitored with Sonicu's System-wide wireless monitoring system. Increase efficiency and patient satisfaction now by filling out the form below.